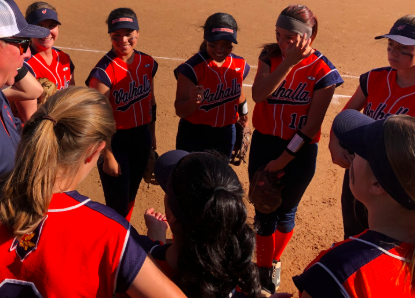 RANCHO SAN DIEGO (4-13-2019) – In their final ballgame in April, the Valhalla Norsemen will take time to enjoy their first Grossmont Hills League victory of the season. Fueled by four RBI by leadoff batter Jade Hill, plus a 2-run homer by Samantha Green, the Norsemen were able to outlast visiting Grossmont, 10-7, at Leto Field. Hill posted a pair of 2-run doubles, while Green went yard in the 1st to open the scoring. Tied at 5-all through two frames, Valhalla scored three times in the 3rd to grab the lead for keeps. A sacrifice bunt by Bailey Munch set up a go-ahead, RBI single from Devyn Ruffer. Then with two outs, an error extended the inning, allowing Hill to double in a pair of additional runs. A single by Brianne Blue and a double by Rainee “Raindog” Foster placed runners on the corners. Both scored on consecutive ground balls by Issy Cervantes and Halle Sweiss. However, the Norsemen answer with a pair of markers in the home-half of the inning, as Hill walked, eventually scoring on a single by Delaney Stettler, who scored on a triple by Green. The lead was enough for Valhalla relief pitcher Maryn Jordan to protect. She closed with three innings of shutout ball, yielding just three base hits. Jordan saved the victory for starter Stettler. For Valhalla (6-17 overall, 1-5 GHL), Green’s 4-for-4 outing capped a 7-for-11 (.636) week at the plate. For Grossmont (13-9, 3-3 GHL), first baseBrianne Blue batted 3-for-4, including her first home run of the season. She led off the 2nd with a blast to ignite a 5-run rally. SANTANA 5, STEELE CANYON 4: At eastern Santee, sultans right fielder Hailey Justice belted a 3-run homer in the bottom of the 6th inning, capping a 4-run rally to topple the upset-minded Cougars in Friday’s (Apr. 12) Grossmont Hills League affair. Moments after second baseman Ashley Madrigal lifted a sacrifice fly just deep enough to left field to allow Emmalee Leggett to beat the throw home, Justice bombed a shot to center field for her first home run of the season. For Steele Canyon, this was a contest that definitely got away, as the first pair of Sultans batters — Leggett and Madison Mendez — reached on errors; all four runs were unearned. The victory was a nice bounce-back for Santana after getting whipped by Granite Hills in the battle for the GHL lead. They remain in second place, one game behind the Eagles. Cougars designated player/third baseman Bianca Morales provided much of the offense. The junior collected three RBI to establish a 4-1 lead. Earlier, Morales posted a 2-run single with two outs in the 3rd, bringing home both D.J. Dumeng and J.J. Venzor after Santana walked the bases loaded. Santana (10-5 overall, 5-1 GHL) saw seven players record one base hit each. For Steele Canyon (9-10, 2-4 GHL), Venzor collected the other RBI with a two-out single in the 4th. GRANITE HILLS 4, WEST HILLS 0: At western Santee, Eagles pitcher Catie Dobbs ran her record to 5-2 (5-1 vs. San Diego County opposition) in tossing a 1-hit shutout at the host Wolf Pack in Grossmont Hills League action. Granite Hills center fielder Baily Wallace, the leadoff batter, paced the offense with a pair of doubles on 3-for-4 hitting. She also collected two runs and a pair of RBI. Granite Hills (16-7overall, 6-0 GHL) also received two hits from right fielder Rylee Omahen, but the remainder of the batting order only had a pair of singles, although one was an RBI base hit for designated player Staci Chambers. For West Hills (5-12, 1-5 GHL), the lone hit was by freshman center fielder Shannon Kim with two outs in the 5th. The lead batter collected an infield single. In addition, senior pitcher Kimie Brouard was solid, allowing just one earned run out five Eagles. FOOTHILLS CHRISTIAN 12, BAYFRONT CHARTER 2: At El Cajon, the Knights capped a busy week by whipping the visiting Sharks by run rule, proving they are a top contender in Division V after defeating a ballclub which placed third in the division last season. Carly Robbins capped a 6-RBI performance, singling home Carissa Wolford (lead double) in the 5th inning to invoke the run rule. Friday’s (Apr. 12) victory was the fourth of the week for Foothills Christian in starting the school’s spring break. Meanwhile, Wolford fired a 5-inning no-hitter, only allowing a pair of unearned runs in the 1st. The Knights then responded with 12 unanswered runs. Wolford struck out nine Sharks against just a single walk. At the plate, Wolford batted 2-for-3 with a double and a walk, while Robbins went 4-for-4 with a pair of doubles, finishing the week hitting a cool .714 (10-for-14). In addition, second baseman Sheyenne Boubion went 3-for-4 and scored twice for Foothills Christian (9-2 overall, 5-1 Pacific). EL CAPITAN 15, MOUNT MIGUEL 1: At Spring Valley, the host Matadors remain a pesky out in the Grossmont Valley League, hanging tough for six frames until the 7th inning when five errors led to nine Vaqueros runs to post Friday’s (Apr. 12) victory. El Cap pitchers Kylie Mead (4 IP, 7K) and Brooke Horn (3 IP, 3 K) combined to throw a no-hitter. The early run was unearned. However, Matadors pitcher Gigi Valencia tossed one of her best games of the season, charged with only four earned runs before her defense let her down in the late innings. For the first-place Vaqueros (1705 overall, 5-0 GVL), Hannah Davis had 3 RBI, Horn added 2 RBI, while Kiki Angeles belted a triple. The Matadors fell to 4-7 (1-4 GVL). MONTE VISTA 21, EL CAJON VALLEY 0: At ECVHS, the Monarchs scored 59 runs in their three victories this week, capped by a GVL decision over the Braves. They also bested La Jolla and Mount Miguel. A combined no-hitter was tossed by pitchers Dessire Corona (3 IP, 7 K) and Ionna Upham (2 IP, 5 K) in the run-rule decision. For Monte Vista (12-7 overall, 3–2 GVL), Kayla Gonzalez had four RBI while Corona knocked in three, as the Monarchs scored nine times in their first at-bats. MOUNTAIN EMPIRE 35, WEST SHORES 0: At Salton City, the 35 runs is the most by Mountain Empire since totaling 29 in a shutout win over Guajome Park on Apr. 26, 2005, when the late Rick Abood coached the program. The school record is 52 in a blanking of Vincent Memorial on May 13, 1999. It ranks as the second-most runs in CIF-San Diego Section history, behind only the California state record 72 runs posted by La Jolla Country Day against the now-defunct Southland Christian of Chula Vista on Feb. 14, 1979. After that record-breaking contest, the LJCDS coach was fired. The RedHawks (7-0 overall) are unbeaten in the Manzanita League at 3-0, trailing Calipatria (4-0) by a half-game. West Shores is 0-6 (0-4 ML).